The works of Liene Sējāne & Kristaps Grasis always have themes. One of the previous themes in their music was dances. The central theme of the new album is images. Images that have inspired the composers, images that form in the listeners mind during a performance, images that allow the listener to identify with new, never before heard sounds. Every peace of work in this album represents an image or a picture, that gives you a starting point, for a voyage through your imagination, to remember this music in pictures and images. 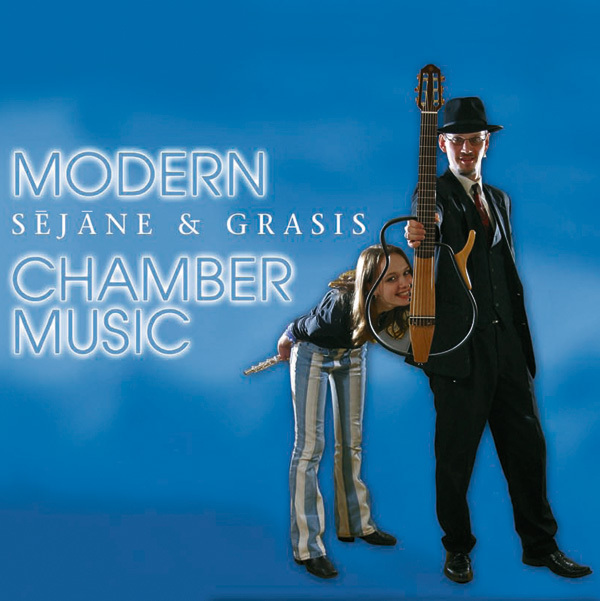 In the ELVE´S SONG Liene Sējāne takes a slightly mystical, somewhat primeval approach into a modern look on chamber music, with the sound of the 20th century, more like a small jazz-ensemble, but with no music of that kind. The FANTASY ABOUT THE WOLF AND THE GARDEN, inspired by a theme from Ralf Wolfgarten is a mixture of styles – jazz, rock and classical music – and yet another view on how people growing up with all different styles of music create new ones, combining their experiences. The duet for flute and guitar, NIGHT TURNS TO DAY, inspired by a poem written by Juris Kronbergs, describes the short moment of the night ( for example, at midsummer) before the break of dawn, when for a fleeting instant time seems to stand still. The album’s central piece is Kristaps Grasis’ THE TRAVELLER´S SUITE, written over a period of two years, illustrating the constant to and from of the two musicians’ life in two countries. The difference between life in the cities and their other life by the baltic sea, and the way from one to another. The piece has five parts: three main parts and two interludes. The first part, THE CITY, recreates the pace of today’s urban lifestyle – the rapid pulse of the city, the sounds and the sights, the excitement and the attraction. The second part (the first interlude), PROMENADE, takes a break from the cities fast and furious life and takes you away for a moment. The third part is THE AIRPORT – the hub, the middle point between the musicians’ two homes and, at the same time, the gateway to the world. The fourth part (the second interlude), ON THE TRAIN, is a rhythmic variation of the first interlude. The emotions are similar, but they are now stiller – earthbound, homebound. The fifth part, BY THE SEA, recalls all of the previous emotions, but also documents the shifting nature of the sea, which draws one back again and again. In IMAGES Liene Sējāne uses complex polyrythms, changes tempos and moods, allowing the listener to conjure up his or her own colours and motives. In the last piece DANCE IN THE HILLS she returns to the primeval aproach using old instruments such as the Scandinavian overtone flute. At the same time , she does not try to avoid contemporary rythms, including modern jazz improvisations and sounds from the far east.